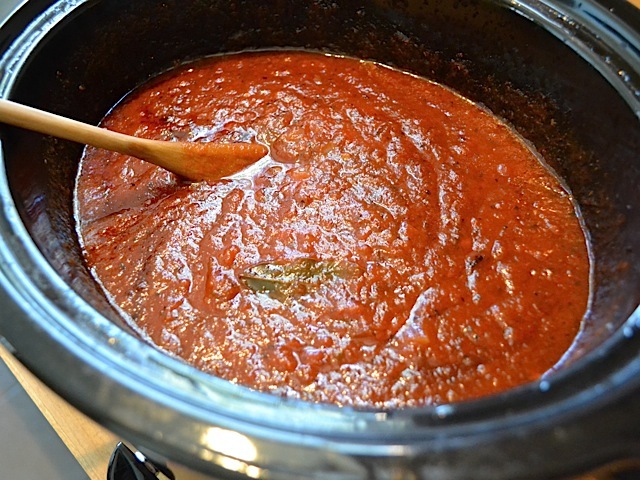 I’ve made a few variations of red sauce for Budget Bytes, but this Slow Cooker Marinara is definitely the best of the best. I don’t like using my slow cooker for everything, but for a few things it works complete magic (beans and meat, for instance). The magical long, slow cooking process caramelizes the sugars in the tomatoes and creates a depth of flavor that can’t be matched! 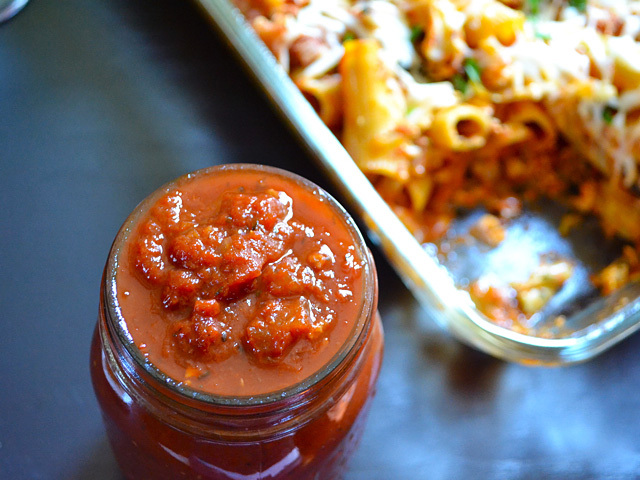 Plus, what more could you ask for than to just throw some ingredients in a pot, forget about it for 8 hours, and then come back to a rich, delicious red sauce? The price of this Slow Cooker Marinara will depend greatly on what you’re able to get your canned tomatoes for. When I made the original (non-slow cooker) version of this recipe a couple of years ago, I paid almost half what I paid for canned tomatoes today. So, the price this time around was about the same as the store bought jarred equivalent, but hey, I made it myself and it’s so much tastier! 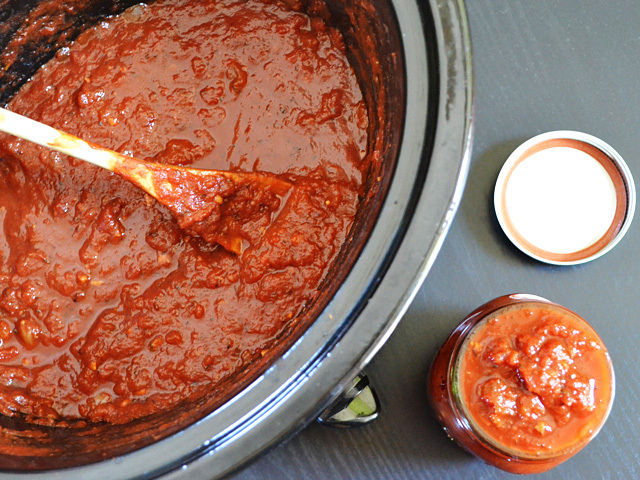 Make a big batch of slow cooker marinara sauce with very little effort. Just add the ingredients and press go! Freezer friendly for easy storage. 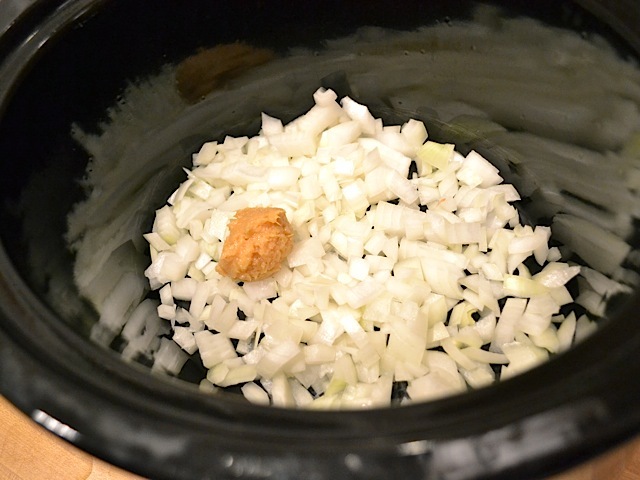 Cut the onion into a small dice and mince the garlic (or use pre-minced garlic from a jar). Place both in the slow cooker. Also add the crushed tomatoes, tomato paste, brown sugar, balsamic vinegar, bay leaves, basil, oregano, and freshly cracked pepper. Stir well to combine. 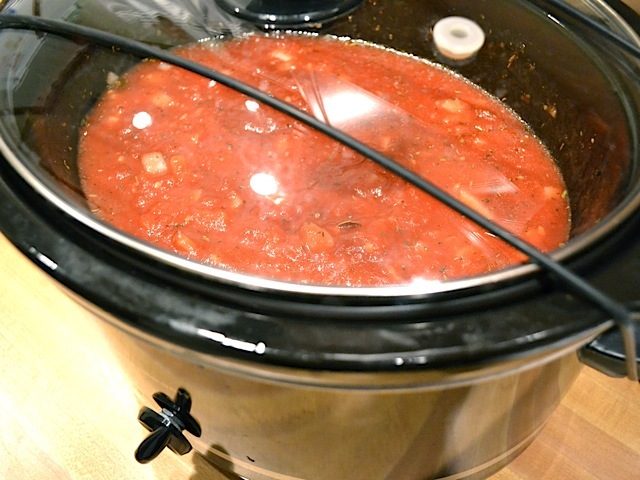 If your slow cooker tends to lose moisture and dry things out, add 1/2 to 1 cup of water as well. Secure the lid on your slow cooker and cook on low for 8 hrs. 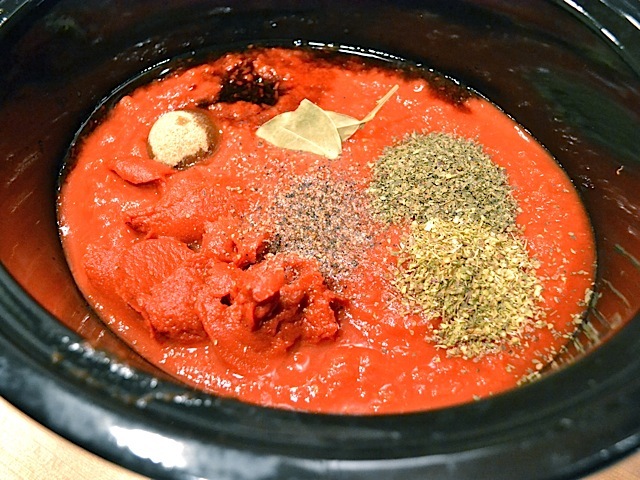 Remove the lid on the slow cooker, stir the sauce, and remove the bay leaves. Season with salt to taste (I added about 1 tsp). Enjoy over your favorite pasta! Now how easy was that? You can also try adding other ingredients like sliced mushrooms, Italian sausage (cook separately and add to the sauce after it has cooked), crushed red pepper, olive oil (for a richer sauce), bell peppers… the sky is the limit. The first time I made this sauce, I served it over homemade gnocchi and almost died and went to heaven. Dice the onion and mince the garlic. Place them in the slow cooker. Add two (28 oz.) 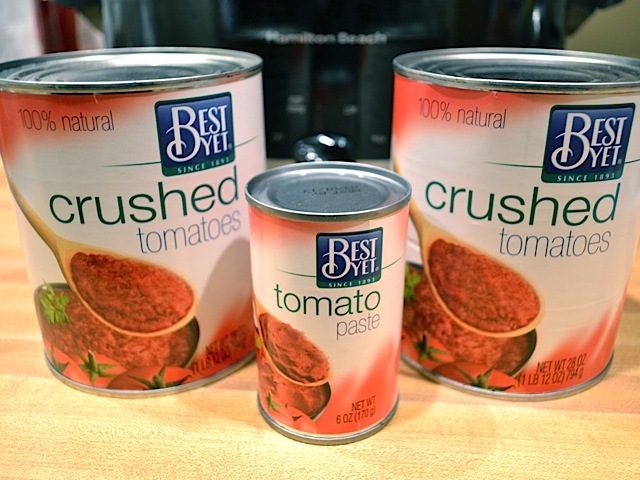 cans of crushed tomatoes and one (6 oz.) can of tomato paste. Crush tomates are the perfect texture for marinara sauce. They aren’t as chunky as diced tomatoes and not as silky/pureed as “tomato sauce”. Also add the balsamic vinegar, brown sugar, basil, oregano, bay leaves, and cracked black pepper. Stir everything really well (try to mix in that tomato paste). Secure the lid and cook on low for eight hours. My slow cooker retains moisture really well so I didn’t need any extra water. But, if yours lets a lot of steam escape or you notice that food usually dries out in your slow cooker, you’ll want to add a little water (up to one cup). Eight hours later, it looks a little something like this. You can see how the color went from a bright, vibrant red to a deep dark maroon. That’s how you know the sugars have caramelized and created that nice deep flavor. Give it a good stir, remove the bay leaves, and it’s ready to go! 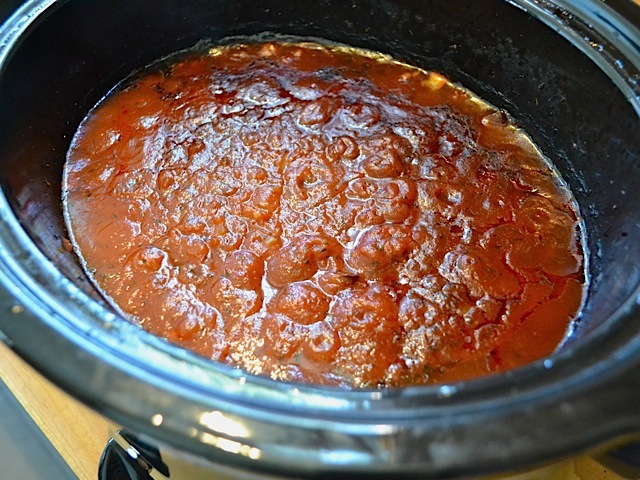 If you plan on freezing some of your Slow Cooker Marinara, make sure to fully cool it in the refrigerator before freezing. I usually refrigerate mine over night and then divide and freeze the next day. Stay tuned tomorrow to see the awesome pasta dish that I made with this delicious sauce! 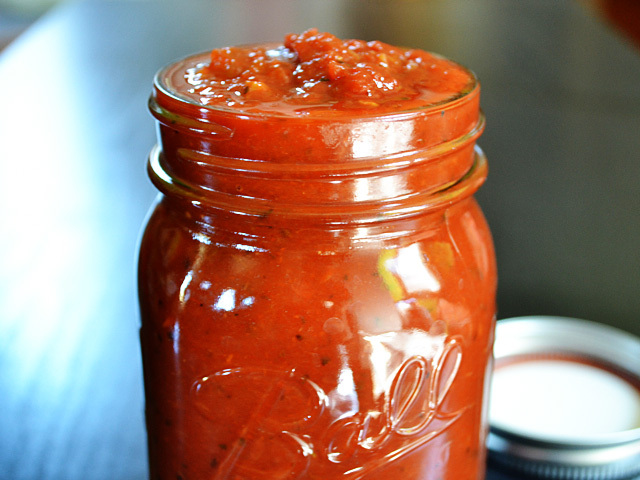 This recipe is just what I’ve been searching for to make a no-sodium marinara sauce. What kind of balsamic vinegar is best? I have red Modena. I love your recipes – many of them are the best things I cook !! I actually haven’t tested this with multiple types of balsamic vinegar, but I’m quite sure that whatever I used (I made this recipe probably 8 or 9 years ago), it was inexpensive and probably not very high quality. LOL The better the quality balsamic vinegar, the better the marinara will taste! Would you rec ommend substituting red cooking wine for. The sugar?